Traipsing down Oxford Street on Friday evening I grew increasingly frustrated that shop after shop had sold out of Christmas jumpers. Staff at some of the high street’s biggest name stores and independents alike said that they had been “overrun” with people buying these “must-have” accessories for their office Christmas party. While the economic doom and gloom continues, you could say that the Londoners have not lost their quest for getting in the Christmas spirit. The capital has been alive with Christmas parties and, from what I’ve seen in recent weeks, there doesn’t seem to have been any let up in the bounds of extravagance and drunkenness. It seems we can’t get enough of Christmas in the capital. Earlier this week, I was disappointed not to be able to get into the Mayor’s carols at Southwark Cathedral. The queue stretched on to London Bridge and a near riot developed as large numbers were refused entry. Two centuries on from when Charles Dickens first spoke of Christmas as we know it (epitomised in his novel, A Christmas Carol), the festivities are still going strong. And what an appropriate time to be acknowledging this, as the celebrations marking the 200th anniversary of the authour’s birth comes to a close. But while the outward appearance is of Londoners enjoying champagne fuelled corporate parties, away from the glitzy West End the reality is somewhat different and many are struggling to make ends meet. For these people, Christmas day will be as miserable as every other day of the year. Thousands of London children are going to school hungry because their parents are too poor to afford breakfast, according to research by the London Assembly. Pupils are feinting in class because they are nothing short of starving. And according to the homeless charity Crisis, the numbers of rough sleepers have risen sharply in the capital. 5,678 people slept rough at some point in London during 2011/12, an increase of 43 per cent on the previous year’s total of 3,975. Looking at these statistics, highlighting the depth of poverty in London, has echoes of when Dickens was writing in the 19th century. Sadly, many people on the fringes of the capital still have an overwhelming feeling of helplessness. This point perhaps sums up the London of 2012 – it’s a city of inequality, in much the same way as it has been through history. And sadly this reality looks set to continue – the rich will get richer, the poor will get poorer. Hopefully of course I’m wrong and things will be much better for everyone in 2013, with the joy of the Olympics filtering through into communities across London. 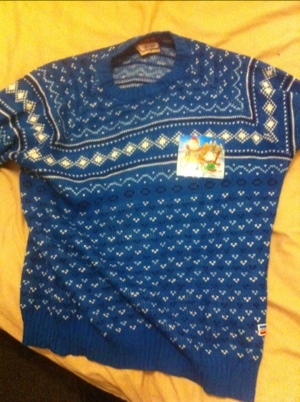 But just in case you are wondering, did I get a Christmas jumper in the end? Well, I did. After visiting more than 10 shops, I finally got one and have already worn it with pride. All it remains is for me to wish all my loyal readers a very Happy Christmas and what I hope will be a prosperous new year for all.